The film is a remake of the 1964 film of the same name. Starring Eddie Murphy as... Center: Sherman Klump. Clockwise from Top Left: Ernie Klump, Sr. (Sherman's brother), Buddy Love (alter ego), Mama Anna Klump (Sherman's mother), Papa Cletus Klump (Sherman's father), Lance Perkins (parody of Richard Simmons), Granny Ida Mae Jenson (Sherman's grandmother). Having watched the movie for the first time back in 2013, I have yet to see it again and it's unlikely that I will. 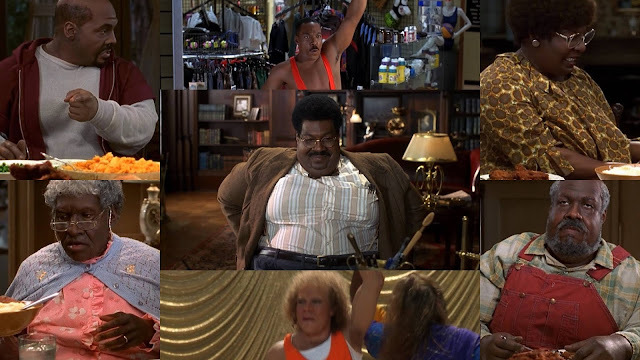 With that being said, there's something fun about seeing Eddie Murphy play the role of seven different characters: the protagonist Sherman Klump (and his alternate identity Buddy Love), Sherman's family (father, mother, grandma, brother), and Lance Perkins (a parody of Richard Simmons).